Over in my freebie thread for SAV's Kouros Hair in the Freepozitory a nice person informed me there was a work around for getting hr2 hair to conform to Genesis WITH the morphs. I was very thrilled to know of this. The information this person left with me though was good for DS 4.0 but things have changed in 4.5 so I'm glad I was able to figure out where everything is! It may not be the perfect solution for all things but it DOES work. SO here is the tutorial. 1) Load up Genesis, keep Genesis selected. note: DO NOT reposition the prop, DO NOT! 3) Look up at your icons on the main tool bar and look for the "bone with a band-aid" or if your more of a menu person look under Tools menu click that (Key strokes are: Alt-Shift-J, select the parented object in the Scene tab. It will become highlighted in white. 5) Edit > Convert Prop to Figure : Leave it as it is: radio buttons clicked ON: TriAx Weight Mapping and Inherit Skeleton of Parent click Accept. The Edit > Convert Prop to Figure option can be found in the context sensitive menu on the top right corner of the Tools Setting pane/dialog. Once this is done the newly boned prop will now be a figure and automatically unparented from Genesis! b: Target: Scene Item: converted prop name will be in the selections, select that! 7) Click: Accept and let it run. Once this is finished then you need to save this out as a .duf file. 9) Save dialog will come up. b: Name the Product Name: converted Props name, no spaces or _ to connect the words if you want. c: Leave the “Item Name” filled in as it is! My Antennae that I made for M4 to do a Chameleon Boy character works perfectly. All the morphs are there and resizes just fine! I've also brought over SAV's Spartacus and Goldtassels Timeless Male Hair and both look awesome. Please don't forget, as much as you want to move the prop into place please don't do that. Just leave it where ever it loads. It will conform perfectly. IF you do move it and it conforms like crap don't come in here and tell me I'm giving bad advice. I've tried it 10 ways to Sunday and found leaving it in place as it loads into the scene is how it's supposed to load and will conform very nicely to Genesis and work as expected. Thank you very much for these detailed instructions! :) Very helpful information. Thanks for the step-by-step, RAMWolff. I'm going to try this. Lord knows I need all the help I can get. Is this specific to DS 4.5? I don't get checkbox for "Inherit Skeleton of Parent " in DS4 and of course, only 4.5 supports ".duf" extension. It gets a very nice fit for hair this way after saving to a ".dsf" but I don't know what happened to morphs. I'm sorry Medzin, I no longer have .47, it was so buggy that I was glad to finally get 4.5, even though it's got some bugs too! I highly recommend DS4.5 over DS4. The improvements made to the program is awsome. I am tempted to leave DS3 behind though i still have some testing to do. I normally do manual fits for boots and hair (yes I saw the other tut) but at the same time if its bennificial I will try another method. After all if I cant get this or something else to worl for me, theres always the manual method! Thank you so much. I really need this for some of my items, such a life and time saver. Yes, 4.5.x was 4.1.x until it was decided that 4.5 would be the released version - as noted in the 4.5.0.1 entries. Rob, I really hope you guys NEVER EVER change Studio's ability to make props conform to Genesis. If it's one of those happy flukes who cares, it works. Thanks for such detailed instructions. That is what I need to learn these tools. I was able to fit the hair and save the DUF just fine and the morphs work, but the PZ2 material presets for hair color do not work. Any suggestions? This process absolutely does not change the UV's so not sure what's going on with that Barbult. I'm working on mats for the Ruff from AprilYSH's Lyon set and hair, hat and ruff all load up their respective PZ2 matt files just fine. I just tried another one - Jai hair from AprilYSH. The PZ2 hair colors work fine on that one. Maybe I'll redo my first one and see if I did something wrong along the way. Thanks again for this great tutorial. It is very well written. I commented on your other thread, to clarify a couple of the steps. The process works nicely, thank you. Load original hair. Apply pz2. Save as material preset. This material works fine with converted hair. Correct but keep in mind PZ2 files are actually created for Poser so you may want to get in there and tweak the Surfaces a bit. I usually hit the Specular area and set that between 67 to 85%, depending. Leave the Specular Strength at 100% for the most gloss but lower it if you have allot of lights in the scene as it will blow out the color too much. 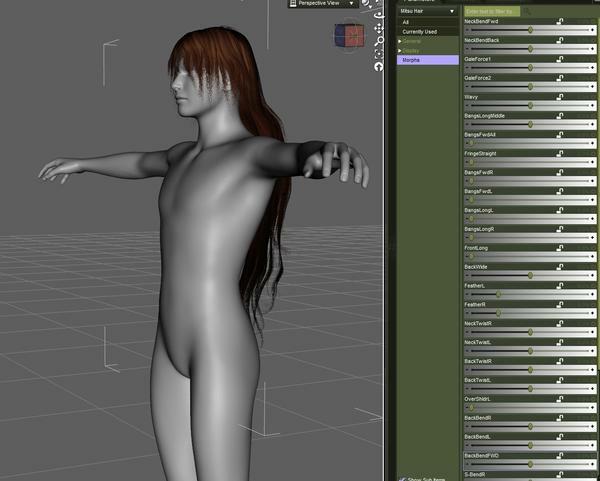 I usually make sure there if there is a bump map file to add more detail to the hair. It's pretty easy. First click on the Diffuse drop down showing all the texture maps for the scene. Find the main one used for the hair in the Diffuse channel and set that as your Bump map as well. Now go back in there and select Browse. It will take you right to the correct folder containing all the textures for that pack and look for a Bump map (should say *bump* or *b* at the end or beginning of the .jpg file name) if not then just leave Diffuse map you originally loaded as the bump map and set it to 100%. I sometimes will do the same for the Displacement map but I set that around 48%, sometimes lower. Make good use of your Spot Render tool. When you get the hair looking the way you want it then select the hair name title to select all the surfaces of the hair and save it out as a new hair color preset in your "My Library". If you only have a few to do it won't take long and you will have native presets. Also, If you have your Poser runtime in another directory other than the My Library/Runtime/Textures/ area I would suggest copying the folder(s) over (make sure you bring over all the parent folders that go with that hair or it won't load up right) to My Library/Runtime/Textures/ so that it's all native. Also don't forget to back up your My Library for safe keeping. Unfortunately, I tried to bring over the Mitsu Hair included with the old Aiko 3 bundle, and it hasn't seemed to have kept its morphs. At least its a cheating way to fit on Genesis, but its useless without the posing morphs. Any clues? OK, just ran my tutorial and it works fine and the morphs are there. Make sure you followed the tutorial to the letter except choose Aiko 3 as your morph target (number #6 in the tutorial). Suggestion, make sure, before you save it out as a .duf file to Convert to Sub-D since the conversion does tend to kink up the area where the shoulders are in the hair. Sub-D smooths that out just fine. Is Mitus hair a CR2 or an HR2 file? XD Keeping people awake since ever. See my post above... works fine! I've been playing around a little with some hair using this tutorial. One of my favorite hairs to use for 'something quick' is the old classic Koz_Messy. Well, it was originally for Gen3 (maybe even Gen2?) and there is no 'clone' option in the basic transfer utility (don't they get added if you get the Gen3 Shapes package? )...but I thought I'd try it by adding a 'fitting pose' to it before the conversion. This should work for any convertable hair that doesn't come for a figure you have a clone shape for, but does have a 'fitting' pose to one of those figures (lots of Gen3 hair has Gen4 fit poses). Just did Mitsu...with a V4 fit and it came out great. So, if you don't have the Gen3 shapes, then using commonly available fit poses is a viable workaround. That's interesting. Good to know. I have all the shapes with their fitting templates so never thought to do it that way.